Discussion in 'Freshwater Aquarium Builds' started by Nanologist, Apr 15, 2017. Hello Fishlore friends! This is my first post and I'm excited to join, IMO, the best aquarium forum around. 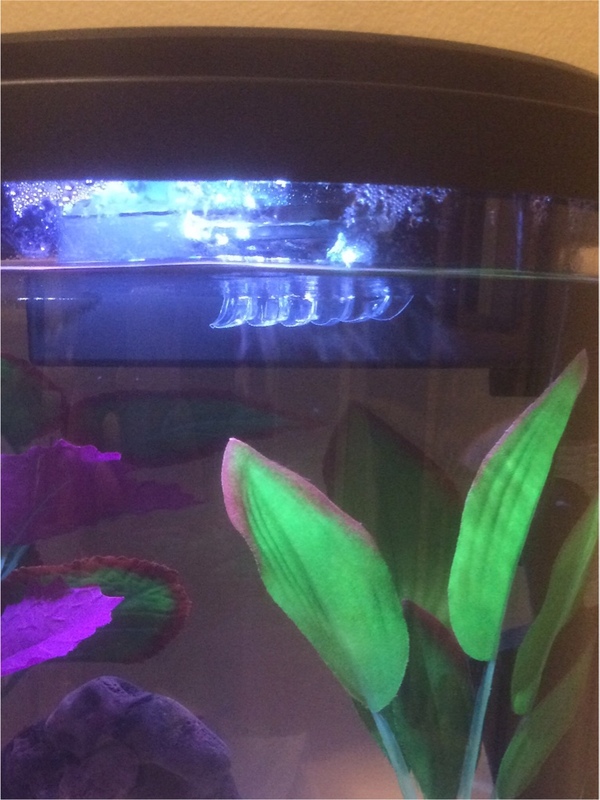 I want to share my recent experiences with my new 3.5 gallon Top Fin Enchant tank setup for our halfmoon betta named Philip Seymour Hoffman (or just Phil for short). The tank is obviously bare minimum size for a betta, but very nicely priced for having a sort of HOB style filter and LED lighting. It's a decent halfmoon shaped desktop tank. The tank is filled with a heater, gravel, 2 silk plants and natural driftwood from our LFS. There were a few modifications that needed to be made for it to be betta friendly, so I thought I'd share these for anyone interested in this tank. First mod was using a razor to cut small openings in the top/back side of the included filter media to remove the activated carbon since it's not really needed if the water is treated with Prime. Next, was to add some bio media to the filter to create a proper environment for the beneficial bacteria to grow. I just purchased a small bag of Fluval Biomax (30 gallon size) and wedged it in the filter after the included floss media (mechanical filter). The final, most difficult, mod was to slow down the water coming out of the filter. This is the most needed mod for a happy betta. With the filter as-is, the water pours straight down and creates a strong downward current which threw poor Phil down into the gravel. The other problem was that it didn't create enough surface movement and a thick bio-film would cover the entire surface within a few days. This was remedied by creating a sort of scoop out of a plastic water bottle and super gluing it to the filter housing. After these modifications, Phil is now happier than ever and gets to swim freely through the entire tank without being thrown around. In fact, one of his new favorite spots to hang out is right under the filter exhaust. This is my first tank since a child, so any advice/criticism is well appreciated. Thanks! Sounds nice, I would go with live plants tho because the silk and plastic ones tend to hold on to bad stuff and removal to clean them is just a headache. Have you got a floating log for Phil? They're slightly expensive but well worth the price. When mine gets tired, he likes to cruise around in the log. Not yet. I'm kinda worried about the floating log taking up too much space on the surface since this isn't the largest tank. He tends to hangout on the driftwood often. I made a tunnel/cave with it at first but he never went in it and preferred just laying on top of it. Is there a way to edit current posts? I wanted to add pics to the original but accidentally added them to my reply. I agree about the live plants, but I wouldn't try anything with that light. Some java moss would do fine, but it's not the prettiest plant by itself. If you decided you wanted live plants, you could replace the built-in lid with a small sheet of glass and use a desk lamp with a 6500k CFL bulb. That'd grow most plants in a tank like that. Do you know what temp the tank is at? 76F-82F is the recommended range, and I think 78-80 is a good place to shoot for. Did you cycle the tank? Thanks! Okay, great info for when I move onto doing live plants. Sounds like you've done your research! I'd just make sure that the plants/driftwood have no sharp edges. Like even relatively sharp. If you find any, sand it down with sandpaper, and it should be fine. Pretty much all my research led me to this site! I learned so much from all of you and I finally had some time today to join this great community and start adding my knowledge and feedback. Hi. Can u please post a pic. I would like to see how you managed that scoop thing. May help me and others as well. You can see it in two of the pics in the original post. It's just kind of hard to see since it's clear plastic. Here's the front pic zoomed in. I'm doing a WC later today, so I'll get some better pics for you all. I am not sure what "bad stuff" silk plants hold on to. A couple of nerite snails can help with any algae, and a turkey baster can blow debris off the leaves. Nothing wrong with silk plants. I personally don't have live plants in my tanks, because it is more work than I want to do. And I cannot keep a plant alive. It's just not my thing. My guy loves his floating log too. It's his favorite place to nap during the day. You could get a betta hammock if you want too. They are smaller. How is your nitrogen cycle going? Stable so far! I got the tank back in February and after filling it with gravel and decorations I did ghost feedings of free flake food. It took a few days for the ammonia to get high enough to register 1 ppm then a couple more to get 4-5 ppm. Of course, I started to get anxious and excited to get a boy in the tank so I researched how I could speed up the process. I ended up buying some Seachem Stability to test out. Not sure how much it helped since I've never done a cycle before, but it ended up completing a little under 6 weeks. After finding Phil and getting him comfy in his new home I continued to check levels daily to make sure there wasn't any spike in ammonia or nitrites. So far no spikes and in fact there seems to be less ammonia being produced since I make sure he eats all the pellets I put in the tank. I test the water before I change it every week and the nitrates never get higher than 15 ppm, so all is well. lol I can't imagine how funny that would be to watch. He says he doesn't like the way you decorated the place and wants to rearrange it. He rips the suction cup thermometer from the wall every day too. Even tried to dismantle his heater once. He's quite the handful. Phil will rest anywhere. He doesn't seem picky. Sometimes I find him on a leaf right at the top and sometimes he's "asleep" on the bottom leaning against the driftwood. I'm actually surprised sometimes at night when I watch him because he won't come up to the surface for air. I'm guessing there must be enough oxygen in the water. It just surprises me because during the day when he's active he comes to the surface fairly often, but I suppose he's also using much more oxygen when active. Fish in general are just a lot less active at night, especially if you turn the lights off in the tank. Wasn't trying to say there was anything wrong with them just saying it's more of a hassle to maintain silk or plastic compared to real. Got around to doing the weekly WC. Here's the pics of the scoop I made for the filter. Have yet to add live plants, but I got some rocks added today! He's already been checking them out and laying on the largest one. I have that same tank and the only issue I've had with it is that the filter intake was ripping Neptune's fins up a bit. I had to cover it and now it is fine. The tank is also scratched in quite a few places, but that is because of me!